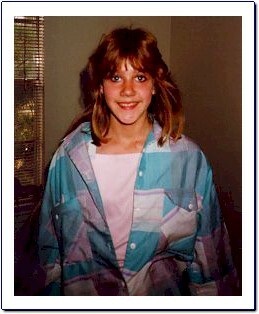 My daughter, April Miller, 24, died in Albuquerque on May 25, 1997, reportedly of a drug overdose. Her body was found in an alley behind the parole office. The circumstances of April's death are suspicious, and the behavior of O.M.I. and the APD homicide investigators is even more so. 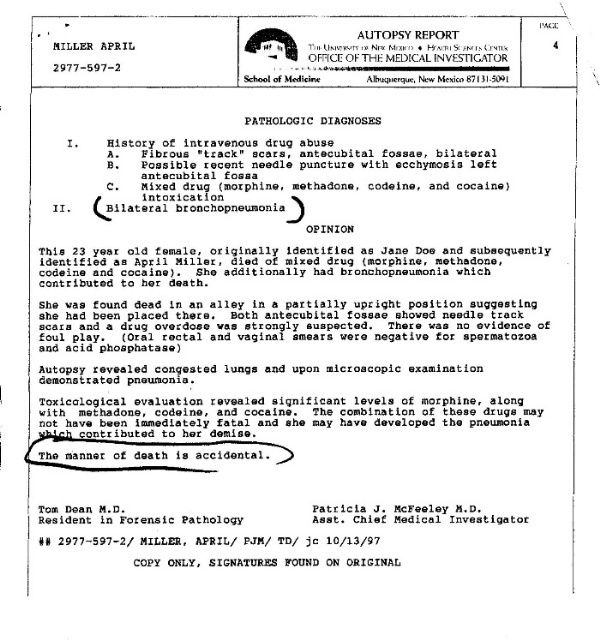 On May 25, 1997, an anonymous person called in a report of April's body in the alley. Although she was listed as "Jane Doe" on the police report, Holly Zimmerman, an employee at OMI, stated that an APD officer at the scene recognized April and identified her. The fact that she was immediately identified is supported by an identifying tag on her belongings bag that bears her name, date of birth, and a notation that the body was identified on May 25. The toxicology report also has April's name, date of birth, and address, and is dated May 28. Local newspapers and TV news carried no story about a "Jane Doe" with a request for help in identifying a body. There's no question but that the police knew who April was from the moment they found her. I last saw April on May 15, 1997, when she came by our house, upset and crying, because her boyfriend, David Genero Lovato, had been arrested. She left with her sister, Rita. April called me from her sister's house once. She called me again on May 23 or 24, to say she was okay and was at "Roland's" house. This Roland lived two or three blocks from the Shamrock Gas Station. It was from that gas station that a call was made to police saying April's body was in the alley. On June 11, I called the police to report April missing. Officer Marcial Segura came to my home and made phone calls to the detention center. He learned that April had been arrested on May 12 and released on May 13. He then proceeded to call hospitals, with negative results. Then he called Missing Persons and reported April missing. Missing Persons did not tell Officer Segura anything about my having to submit a statement in writing saying it was out of character for April to be gone and not call for that long a time. On July 11, I called Officer Segura to see if he had heard anything yet. Officer Segura called Missing Persons, and only then did they tell him that they needed a written statement from me. I called Missing Persons to find out exactly what I needed to do to file a missing person's report. That's when I was informed that April, who had been listed as "Jane Doe," had been found dead behind the parole office over six weeks earlier. I went straight to the Officer of the Medical Examiner to verify that "Jane Doe" was my daughter, but when I got there they wouldn't let me view her. Instead I was shown one autopsy photo and made a positive identification from that. That's when Holly Zimmerman told me April was identified at the scene by an officer at the scene. When I returned to OMI about a week later to ask for enlargements of the crime scene, a man named Brad Barnett informed me that Ms. Zimmerman was new to the department and had made a mistake in saying that April was identified at the scene. I thought it was odd that Mr. Barnett was the one assigned to talk with me, since he hadn't been to the scene and he wasn't involved in the autopsy. When I tried to contact Mr. Barnett later, OMI told me he no longer worked there. I tried to contact APD Officer Debbie Heshley, reportedly the first officer to arrive at the scene. She never returned my calls. I, then, left a message for Tod Babcock, who had been sent to OMI to fingerprint April's body. I was not at home when Officer Babcock returned my call, but he told my roommate that he had recognized April from a confrontation he'd had with her on May 15, 1997, when she gave him her address, which is on file with APD and Metro Court. April's life had not been easy. Her sister, Spring, 16, was murdered on January 29, 1988, and April was with her at the time. The girls had gone for a walk, and as they approached the entryway to an apartment complex, they noticed a blue and white high rise 4x4 waiting to leave the parking lot. They stopped and waited for the truck to pull out, and the driver motioned for them to cross. When they stepped out in front of the truck, the man grinned, stomped on the accelerator and ran both girls down. He ran over Spring's head with both front and rear right tires; he ran over April's legs. Spring died, and though April survived, she was never the same again emotionally. 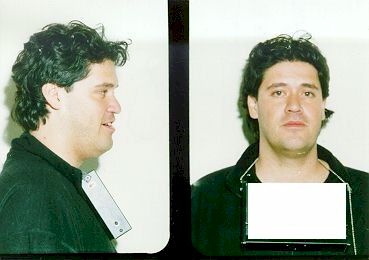 Although there were witnesses to what happened, and the suspect matched the description of Martin C. Martinez, who was arrested in June, 1988, in connection with deliberately running down joggers with his vehicle in the same area of town where Spring and April were run down, he was never charged with Spring's death. At that time the APD Homicide Unit was too involved with the investigation of several high profile murders, (including the Darcy Pierce case), to take the time to investigate the killing of Spring. Spring's investigation was done by traffic officers. The case remains unsolved. I told my Spring goodbye on February 4, 1988, and on May 4, 1988, my son was killed in a suspicious motor vehicle accident that was never reconstructed. The tragic deaths of her two siblings caused April to turn to drugs. At the time of her death she had a record of arrests for drug charges and other things. It would have been easy for police to identify her, especially when her name was tattooed on her neck. 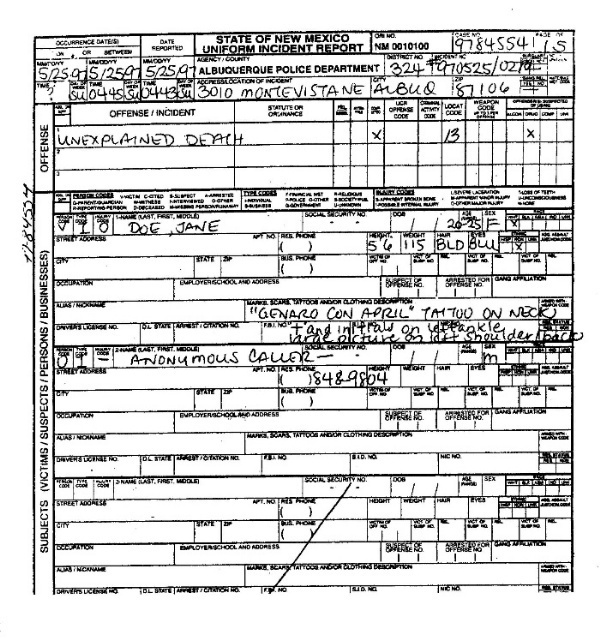 Why do police reports refer to April as "Jane Doe," when APD Officer Babcock, Ms. Zimmerman at the OMI, and the tags on April's belongings bag and toxicology report all indicate that she was immediately identified as April Miller? Why did it take the police over six weeks to notify our family of her death? Why wasn't I told that my missing person's report had to be made in written form? Why was there no investigation of April's death? Even though she reportedly died from ingesting drugs, that doesn't mean that there wasn't foul play involved. After all, somebody dumped her body in the alley and phoned the police to inform them about it. Why was the mysterious Roland, the last person to see her alive, not investigated? Why was Spring's death treated as a traffic accident rather than a homicide? Why was no attempt made to investigate it as a vehicular assault by Martin Martinez? If my daughters'cases are examples of APD investigations, then God help the citizens of Albuquerque.